I have promised to keep Thy words. And turned my feet to Thy testimonies. And of those who keep Thy precepts. Heth is again a time of remembrance by the psalmist that is provided by the grace of God and the Word of the Lord. This remembrance is found in verse 57 as the psalmist is reminded that God is “his portion.” In other words, God is the giver, savior, & sustainer and when it comes to obedience, this is the first factor of grace that we must remember. Without remembrance of all that God is and all that God has done for us…obedience becomes shallow and rigid religion. Because of “Who” God is we can know that obedience is worthy of Him in the strength of His faithful character. Because of “What” God did to provide the the relationship that He has freely given us, obedience is out of desire to show love and gratitude back even though it can never repay His ultimate love. The psalmist promises to keep the Words of the Lord and to pursue them with his heart. But, he knows he will fail at this and the psalmist boldly declares the Grace of God that the Word has made known to us. He remembers that obedience means intentionally considering God as well as asking God to help us consider our path so that we may choose the path of faithfulness and integrity. 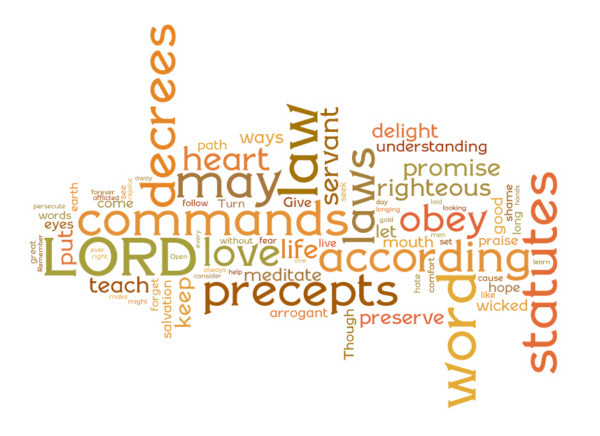 The big ideal in this remembrance toward God and obedience to His Word is this. God has revealed His lovingkindness to us and the freedom to live with and for God by His Grace.